SANITRON® Replacement Ultraviolet UV-C Lamps - - - IN STOCK & READY TO SHIP! 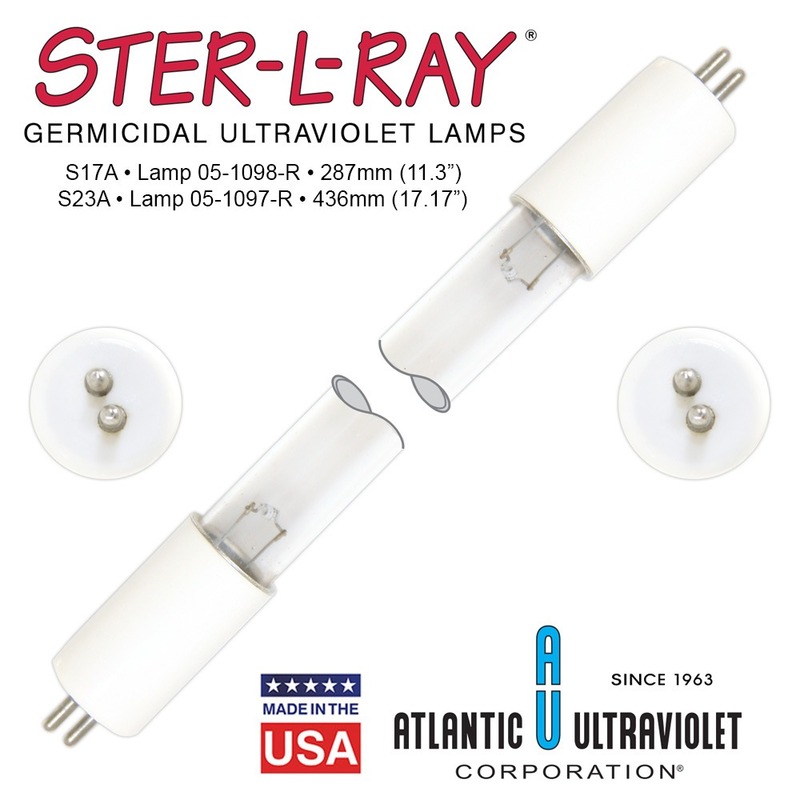 The 05-1098-R is the replacement UV-C lamp for the Atlantic Ultraviolet Corporation® SANITRON® S17A single chamber ultraviolet water purifier, as well as the previous version of this unit - the SANITRON® S17. It is a 287mm (11.3") long, 14 watt germicidal lamp, capable of deactivating and/or inactivating a long list of pathonogenic microorganisms. It features a double ended mini 2-pin base. 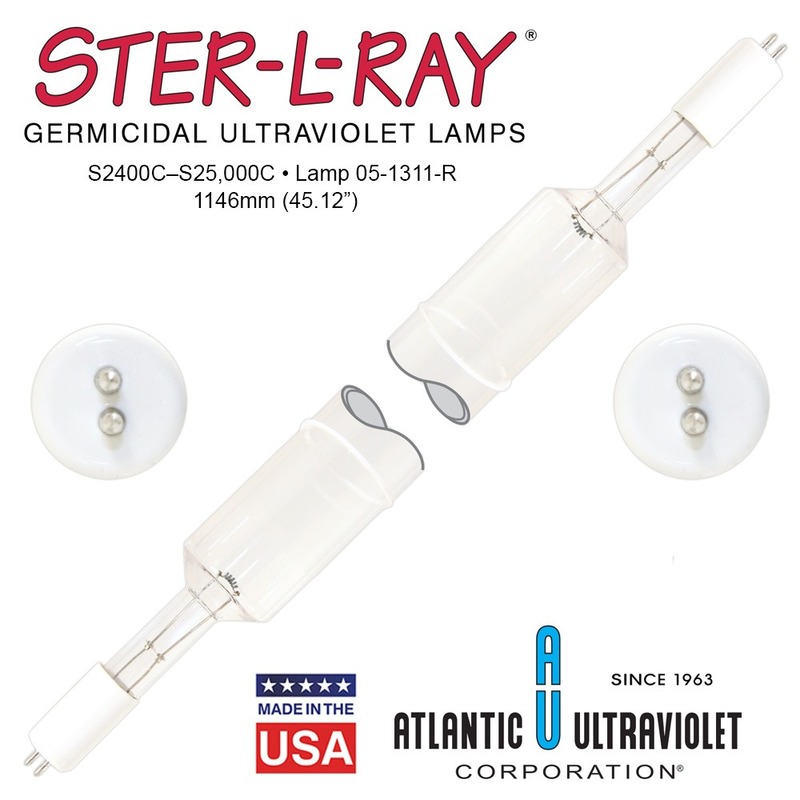 The 05-1097-R is the replacement UV-C lamp for the Atlantic Ultraviolet Corporation® SANITRON® S23A single chamber ultraviolet water purifier, as well as the previous version of this unit - the SANITRON® S23. It is a 436mm (17.17") long, 21 watt germicidal lamp, capable of deactivating and/or inactivating a long list of pathonogenic microorganisms. It features a double ended mini 2-pin base. The 05-1343-R is one of the most common germicidal ultraviolet UV-C lamps in the UV industry. It is a replacement lamp for several Atlantic Ultraviolet Corporation® ultraviolet water, air, and surface purifiers, including the SANITRON® S37C, as well as previous versions of this unit (the SANITRON® S37B and S37A). It is a 843mm (33.19") long, 41 watt germicidal lamp, capable of deactivating and/or inactivating a long list of pathonogenic microorganisms. It features a double ended single pin base. 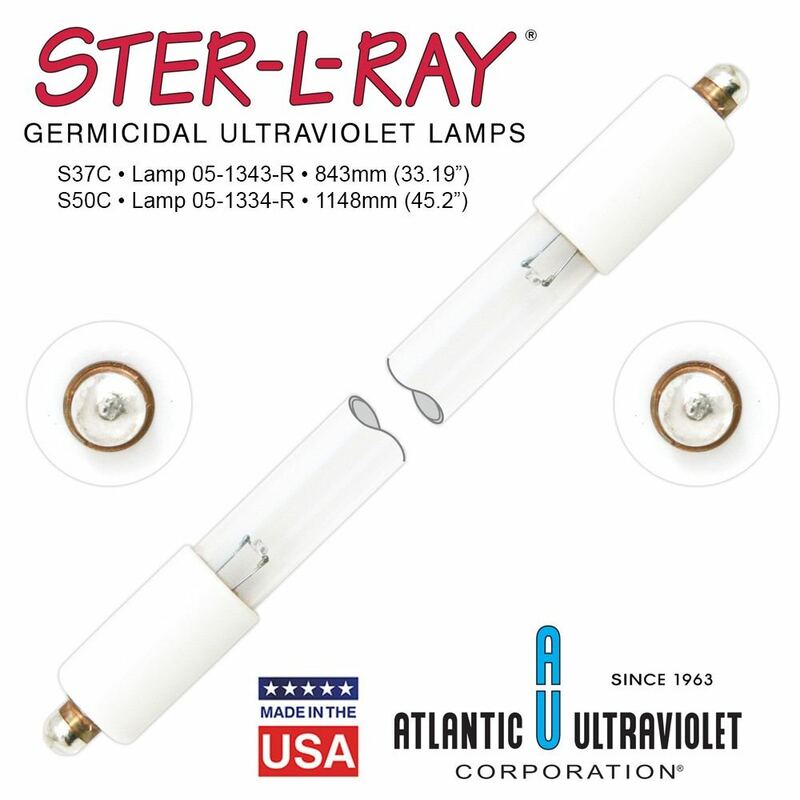 The 05-1334-R is the replacement UV-C lamp several Atlantic Ultraviolet Corporation® ultraviolet water, air, and surface purifiers, including the SANITRON ® S50C, as well as previous versions of this unit (the SANITRON® S50B and S50A). It is a 1148 mm (45.2") long, 55 watt germicidal lamp, capable of deactivating and/or inactivating a long list of pathonogenic microorganisms. It features a double ended single pin base. The 05-1311-R is a 1146mm (45.12") long, 110 watt germicidal lamp, capable of deactivating and/or inactivating a long list of pathonogenic microorganisms. It is a high intensity, high output lamp, with a quartz diameter of 38 mm. It features a double ended Mini 2-pin base.